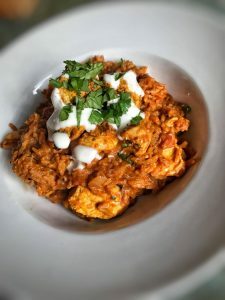 My chicken and chorizo jambalaya is one of my most popular recipes and I’m also a big fan so last week, when I was thinking of ways to jazz up my jambalaya, this idea hit me and I knew I had to give it a go. The result was delicious, filling and yet packed with flavour, you would never believe that the bowl food of food that I ate at the end was only 6sp. Even better, it now means I have two delicious recipes for jambalaya…winner! 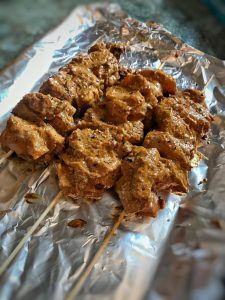 The recipe I created involves marinading the chicken a little and then grilling it separately to give the dish that true chicken tikka flavour. If you don’t have time for this however, simply pan fry the chicken with 1kal in the garlic, ginger, lemon and spices, remove from the pan and then add back when the recipe dictates. Take a large bowl and add all the ingredients for the chicken marinade, stir and then add the cubed chicken. Coat the chicken, cover with cling film and then pop in the fridge for half an hour (or up to 8 hours if you have the time). Whilst the chicken is marinading you can start with the jambalaya. Spray a large saucepan with 1kal, add the onions and fry for 5-7 minutes until they start to soften (add a little water if the pan gets too dry). Next add the garlic, peppers and rice and fry for another few minutes. Next add all the dry spices with a little splash of water and stir to combine. Fry for a minute and then add the chopped tomatoes with 250ml of chicken stock. Stir and then cover with tin foil and simmer for 20 to 25 minutes until the rice is cooked through. Keep stirring the pan throughout so the rice doesn’t stick and add more stock as you go along so it continues to cook. You want the finished dish to be nice and moist but not ‘saucy’, almost like a risotto. You might not use all the stock, it will depend on how hot your hob gets but you want to make sure that when the rice is cooked, that the jambalaya isn’t too wet. Whilst the rice is cooking, thread the chicken pieces on to skewers (I used wooden skewers and soaked them in cold water for a few minutes first to prevent them burning in the grill) and then pop under a hot grill for 15-18 minutes (until cooked through). Keep turning the chicken so that it browns nicely on all sides. Reserve the remaining marinade from the chicken bowl and add to the rice mixture whilst it bubbles away. Once the chicken is cooked, remove the skewers. 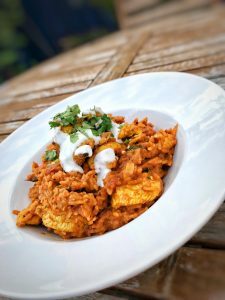 Keeping a few chunks aside to dress, toss the rest of the chicken through to jambalaya, add another 2 tbsp of yoghurt and the juice of half a lemon to the pan and stir. Season to taste and then pop into bowls. Top with the reserved chicken, a small dollop of yoghurt and a sprinkle of fresh chillies and coriander. Looks stunning have added this to my recipe folder for a chilly weekend meal. Thank you so much for your lovely recipes. I tried this tonight and it went down well with the whole family – thank you! Made this for non WW friends…what a hit! Absolutely fantastic and will be a firm favourite in our house now! loved the chicken and chorizo jambalaya. cannot wait to make this for the family tonight. I have just marinated the chicken and the marinade looks and smells delicious! Another Brillent recipe. Big portion really enjoyed it. Made with brown rice,very filling. OMG!!! Just cooked this tonight and it was amazing!! Cut down on the rice amount to 70g for 2 and used birdseye chilli for extra whoof! OMG!! Just cooked this tonight, it was amazing!! I did cut down on the rice to 70g for 2 people and used 2 birdseye chillies for extra woof!! Will be cooking this again. Ah glad you enjoyed Janey!! We always add extra chilli – love it! Made this tonight. It was fabulous and I will be making it again very soon! So glad you enjoyed Jackie!